Professional plumbers should be the only folks who handle caustic chemical drain cleaners. Sure, you could use them to keep your drains working like they should. But the dangers from them outweigh any possible danger to property and lives. When professionals use them, they are extremely effective. Therefore, only licensed, experienced professionals should them. Biochemical cleaners that use yeast or bacteria are not typically caustic. However, they still have some cautions you need to be aware of. In the majority of cases, adults can use the biochemical so long as the directions are followed. It’s imperative that the product’s cautions are strictly followed. You don’t want to get it into your eyes or accidentally ingest it. Chemicals can effectively clear out a clogged drain but there are several hazards to using them. Of course, the list of them isn’t complete. Thus, you’ll have to read the product label and check out the Material Data Safety Sheet, which you can find on the Internet or have the company fax or send you a company, on the product before you use it. In most cases, chemical drain cleaners can react with water quite violently because they are so caustic in nature. And, when this happens, they can let out a poisonous fume. The only exception to this are drain cleaners that depend solely on biological means like bacteria to eat at the organic material, causing the slow drainage. 1 – Bear in mind that if you call a plumber, the chemical used in attempting to clear the drain can damage his/her equipment. And, it’s possible the chemicals can result in an injury. If you don’t let the plumber know what chemicals you have used, you could be liable for any injuries or damages. 2 – Sodium Hydroxide will generate caustic – near odorless and colorless – fumes. 3 – Some chemical cleaners have been known to produce heat that can cause the plastic pipe to melt. 5 – Poisonous gases that are let into the air can cause serious injury or death. Pets like birds can be killed by a minute amount of these gases. Be sure you have proper ventilation and that, when you use these products, nothing is around – people or pets. 6 – Always put the liquid acid into the water, not the other way around. If water is put into the acid, it may explode. 7 – Some acids continue to heat up so leaving them in the urinals or toilets after the time indicated on the label, it may result in explosions or cracks. 8 – Chemical drain cleaners work to break down the organic material with many of them working rather fast. Since your body is an organic material, incorrect use or unintentional contact can result in severe burns. In the majority of cases, chemical drain cleaners should only be used on slow drains. 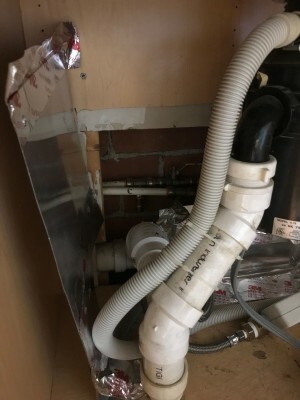 If it’s a slow running drain, the chemical should clean the offending organic material out so that it passes through the drain system without causing damage to the plastic pipe. If it’s completely stopped up and you use the chemical to clear it out, you take the chance of it not working and causing even more headaches for you. Remember, to tell the plumber that a chemical was used for their safety as well as for their equipment. This is a rapid-acting chemical that dissolves organic material in 60 seconds. It will generate heat and gas but doesn’t last more than two minutes. To use, it must be carefully placed into the drain and slowly adding hot water. This may come in a wax coating but not always. Be sure to fully read the directions. This acid gets hot when it touches waters, and its effects tend to last far longer than the hydrogen sulfide. Car batteries generally use it to digest metal and generate electricity. It will generate a noxious odor with a smell similar to rotten eggs, and is used to clear out slow-moving drains. This is used to clean the deposited salts that accumulate on toilets and urinals. As time passes, it also heats up and is extremely reactive to water. 4 – Biochemical cleaners can digest and break down organic matter that results in slow drains. Restaurants will use these cleaners to ensure their drains are kept clean, especially the drains that accumulate grease. Plumbers note these as being drain sweeteners because the smells they produce are far nice to the nose. While safe to use most times, it’s still important to read the directions and follow them exactly. Hi wethead, i really like your topic and info about 4 Kinds Of Chemical Drain Cleaners, Keep write this type of topics it’s really informative for drain cleaning.